This small area near Moscow became an epicentre of literature in the Soviet days. The streets here are named after the great authors' names and a special order of things remains. The Handbook 1935 "Cottages and neighborhood of Moscow" on Peredelkino, unknown at the time, dryly states: "A pine alley follows from the station. In the estate, which is a state farm today, there is a wonderful park with pine trees and a deep pond, suitable for swimming and fishing. Despite the lack of electricity, a post office, telegraph, telephone, cinema, and other cultural and general amenities, summer visitors readily populate Peredelkino. They are attracted here by its beauty..."
The Handbook "Cottages and neighborhood of Moscow" had been compiled before they built the 50-storey wooden country houses in the writer's village, founded the Literary Fund of the USSR, on the advice of the writer Maxim Gorky. This was before the times of Ilya Ehrenburg, Lev Kassil, Boris Pasternak, Ilya Ilf and Yevgeny Petrov, Bulat Okudzhava, Bella Akhmadullina, Korney Chukovsky and dozens of other writers and poets who later became Soviet classics. By train from the Kievski Railway Station to Kaluga, Peredelkino station. Exit on the right side of the church, to the Writers’ village, follow the signs. The village’s new "purpose" had a considerable influence on its toponymy: the streets named after the classics Gogol and Lermontov, the Soviet writers Gorky, Dovzhenko, Serafimovich. The name of the village of Peredelkino near Moscow is associated with the entire history of the twentieth century Russian literature from the 30’s to the 90’s. During these 80 years, Predelkino has changed dramatically. The large field separating Pasternak's country house and the Peredelkino church has disappeared, so have the famous summer visitors, a memorial cemetery and museum homes have appeared, but the pond and the forest are still there, the same pine alley still leads to the writers’ country houses from the station. Boris Pasternak, one of the most outstanding poets of the twentieth century, moved to Peredelkino in 1936. The village gave him a chance to be reborn – the "end of a painfully long intermission (of 10 years)"; put in his friend, poet Anna Akhmatova’s words, when Pasternak could not write a single line. Boris Pasternak considered his series of poems in 1941, "Peredelkino ", one of the best works he had ever written, and here in his country home, he finished his novel "Doctor Zhivago", translated Shakespeare and Goethe. It was at his home in Peredelkino that Pasternak found out about his Nobel Prize for Literature award. The Soviet authorities led by Nikita Khrushchev accepted this with resentment, because they considered the novel "Doctor Zhivago" to be anti-Soviet. Due to the "hunt" unfolded in the Soviet Union, Pasternak was forced to decline the Prize. The poet died on May 30, 1960 in his home and was buried in the Peredelkino cemetery, which has become a memorial today .Only on February 10, 1990, Pasternak’s 100th anniversary, a museum was opened in his house. UNESCO declared 1990 Pasternak’s year. The poet’s granddaughter and the museum’s curator Elena Pasternak writes, "... at that time I had to study the special arrangement of things in the house..." Her grandmother used to attach the yellowed leaves of her detailed list to the inner walls of the chest, "Tablecloth with embroidery – 3, tablecloth with green embroidery – 1, ordinary tablecloths – 4..."
With the museum’s creation, all the things were back in their place. 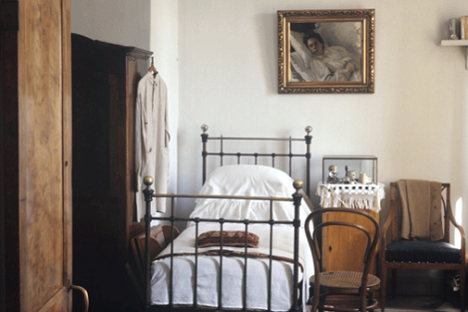 In Boris Pasternak’s house, as before – it was simple and austere. On the walls there are paintings by Leonid Pasternak, his father, Academician of Painting, who used to illustrate the works of Leo Tolstoy. Some of the poet’s verses and his favorite music can still be heard in the house; his furniture, collection of vases on the dresser, flowers in clay pots, books – everything is in its place, "the special order of things" is restored. Opening hours: Thursday to Sunday, 10.00 am. - 4.00 pm. A publicist and children's author, whose books were read by several generations of Russians, settled in Peredelkino a few years before his death in 1966. A national favorite, winner of a number of state awards, however, he still kept contact with dissidents. In his country home, he used to arrange meetings with the neighboring children, he talked to them, read poetry, invited them to meetings with famous people, famous pilots, actors, writers and poets. The Peredelkino children, who had become adults a long time ago, still remember those childhood gatherings in Chukovsky’s country home. Journalist Kira Vasilyeva recalls: “Here on the plot, Korney used to hold his famous bonfires, where there were thousands of children from the surrounding villages, resorts and pioneer camps. Here, in his Peredelkino home, is where they heard the news of Chukovsky being awarded the Doctor of Literature title by the Oxford University, one of the oldest in Europe (before him, among the Russian writers such honor of was given to Zhukovsky and Turgenev) . Here, Alexander Solzhenitsyn (Russian writer, dissident and 1970 Nobel Prize for Literature laureate – editor’s note ) officially considered a janitor was waiting out for a better fate." Korney Chukovsky’s museum home was opened due to the efforts of one of his four daughters, poet Lydia Chukovskaia, who was handed down the copyrights to her father’s works. The house’s interior is completely recreated to the way it was during the poet’s his last years of life. There are more than 6,000 exhibits, including a unique library, which has about 5,000 books, children's events and parties that Korney Chukovsky was so fond of are still held today. In 1987, the Soviet poet and songwriter Bulat Okudzhava received a small country house to rent in Peredelkino from the Writers' Union. It is here that his last autobiographical novel “The liquidated theater”, which won the Booker Prize award was written, as well as hundreds of songs, poems and stories. Here is where his last journey to Germany and then to Paris started, where he died in the summer of 1997. A year later, due to the efforts of the many fans of the composer, the "Peredelkino National Museum of Bulat Okudzhava", was opened on a voluntary basis. A year later, the museum acquired the status of federal museum. Every week there are meetings and concerts held here – "Bulat Saturdays", children's events – "Bulat Sundays", in the autumn, Okudzhava’s followers organize commemoration evenings, where his songs and poems are performed, as well as an international festival of Bulat Okudzhava’s original songs, performed in Russian, Japanese, Swedish, French, Hebrew and many other languages.